Posted by maplesgw on Thursday, March 15, 2018 in News. 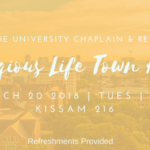 The Office of the University Chaplain & Religious Life (OUCRL) invites the entire Vanderbilt community to participate in the upcoming Religious Life Town Hall on Tuesday, March 20th, 2018 beginning at 6pm in Kissam 216. As an office charged with serving the spiritual needs of this community, your voices are imperative in the doing of this work. 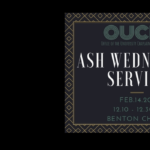 Come and share your thoughts so that we might know where we are succeeding and where we need to direct our attention as to better meet your religious/spiritual/ethical needs.